In case you are looking for a solution to your foot and heel pain, which is always gonna get more painful as the day goes on, or you are simply looking for some decent support for your feet when you are around the house, then maybe you need some slippers with arch support to help you out. Find the cause… and solve it! It could be that you are a tad bit on the obese side, or that you train very strenuously. It can also be that you have flat feet or high arches. All this stuff factors into the daily discomfort in your feet. You should always look for ways to take the strain off your plantar fascia ligament. If you strain it for too long and for too hard, then you are going to develop plantar fasciitis, which is a very painful condition that you do not want to suffer from. You require good arch support in order to alleviate the strain that you place on your plantar fascia. Once the plantar fascia becomes inflamed, you are a long way from home. Nip that pain in the bud! Once you have developed plantar fasciitis, getting rid of it is going to be a full time commitment. You will require very supportive footwear during your day. And if you enjoy walking around the house on slippers, then you are going to need slippers with arch support. The other option is trying to treat your foot pain by taking pain killers, but I always recommend solving the problem at its root. If you don’t, you will have to visit a physical therapist, which takes up even more of your precious time and resourcses. Your therapist or physician is likely to recommend conventional treatment anyway. In order to spare your own feet, minimize walking barefoot and make sure to wear comfortable footwear that supports your arches. This slipper is designed by podiatrists to provide appropriate arch and heel accommodations, that promote a good stride while preventing excessive pronation. They can also be conveniently adjusted to make sure that they fit your feet properly. The upper is made of plush polyester to provide the ultimate in slipper comfort. Additionally, an adjustable loop and hook closure, make it easy to put them on and take them off, as well as providing a secure fit. The slipper has also been designed with a biomechanical footbed featuring 100% polyester terry cloth to provide extra comfort. An EVA midsole provides shock absorption, thereby reducing stress on the ankles, knees, and feet. The Orthaheel Relax Slipper also features a TPR outsole, covered with fabric designed for indoor use. This slipper will provide you with all the necessary support that you need around the home. These arch support slippers are ideal for people suffering from plantar fasciitis and overpronation. They are supportive and soft, and will help you in getting rid of your pain quickly. The flexible plastic on the bottom lets you wear them outdoors to take a stroll. Another great thing about these slippers is that they are durable. They are going to serve you for years, without losing their structural composition. These are excellent slippers, especially for people with foot problems. When it comes to choosing the right pair of slippers, every person has their own preferences. Some people want a versatile and durable slipper, while others want something to keep their feet comfortable around the house. However, you can get all those things into one, with the Isotoner Terry Embroidered Scalloped Clog. This nice piece of footwear comes with a lot of great features, to keep your feet happy. The slipper is exceptionally comfortable while keeping your feet warm throughout the day. With an open-backed design, it is easy to slip them on your feet. And once it’s on there, it will keep your feet secure. They come with a nice foam insole for adjusting your feet, while providing good support and comfort. The inside has been lined with terry fabric, which keeps your feet comfortable and warm. I’ve looked long and hard, but the fact is… there is almost nothing to complain about. It comes with an outdoor sole, which can be used for walking outdoors to go and get your mail. The outdoor sole provides plenty of traction and stability. However, it is advisable to minimize outdoor use. They are machine washable, which makes cleaning them a breeze. The Orthaheel Gemma Slipper is among the best women’s slippers with arch support. If you believe in style and comfort, even at home, then you should consider the revolutionary Orthaheel Gemma. With a plush upper, you will not feel like leaving your home, since you want to have them on your feet throughout the day. They feature a man-made lining, together with a cushioned footbed for enhanced comfort both day and night. On the other hand, the durable rubber outsole provides the right amount of required traction, as you go through your indoor chores. The slipper is so comfortable that you might even be tempted to sleep in it. The sole is synthetic, while the upper material is fabric, making it a very light and convenient slipper to wear all day if you have to. It provides a pain-free, convenient, natural healing solution to everyone suffering from common pains and aches, that are normally brought on by improper lower limb alignment. The technology used in this slipper is clinically proven. It helps in reducing excessive pronation, which is one of the main causes of plantar fasciitis. The slippers also have an odor reducing and EcoFresh antibacterial footbed to keep your feet fresh all day. Additionally, the TPR outsoles, covered with fabric, have been designed with a wave patterned tread, to ensure maximum traction and stability. For arch support, the Orthaheel Gemmas have been fitted with an integrated orthotic footbed. These slip-ons will surround your feet with luxurious softness. It is a great slipper for indoor use, featuring a pillowy collar. This provides the ankle area with plenty of softness. The upper, featuring soft Italian fabric, provides a fashionable touch. On the other hand, the inside of this slipper has been luxuriously lined, using comfortable faux chinchilla material. The Signature Comfort sole used in this slipper, comes with numerous therapeutic and orthopedic features. These include an insole lining that wicks moisture away, ensuring your feet remain dry. Additionally, the soft touch, low-density foam provides reliable softness with every step you take, while the non-skid outsole featuring a raised arch and heel design, is weatherproof. This ensures better support and footing. This comfortable orthopedic slipper, is mostly suitable for indoor use. However, you can still use it minimally outside, for example when collecting the newspaper or other mail. Whether you are watching the TV or just reading a novel, the comfort and luxury associated with the Acorn brand never disappoints you, when you have this slipper on. For convenience and comfort, this is one of the best women’s house slippers you can get. They are easy to slip on and off, and their friendly warmth will quickly grow on you. Release the stress of a hectic day and let your feet relax into the posh luxury of the Sorel Nakiska Slide Slipper. The slipper features a molded EVA footbed, which is plush and very comfortable. The footbed is also removable, in case you intend to use your own orthotic inserts. The outsole is made of lightweight rubber, with a tread design guaranteed to provide you with reliable grip and traction indoors. The upper is made of suede leather, which is lightweight and easy to clean. Acrylic and wool blend has been used for interior lining, wrapping your feet in luxurious comfort every hour of every day. The sole is suitable for both indoor and outdoor use. However, it is advisable to limit the amount of outdoor use, since the slipper is specifically designed and made for indoor use. For people suffering from arthritis, this is the perfect slipper. It will keep your feet pain free and comfortable. You can even wear them with socks, and you will still be able to retain all the comfortable features. The slipper is true to size, super warm, has a nice shape, and a rubber sole for a quick dash outside. It will keep your warm. The arch support is something that you are going to grow accustomed to quickly. The Haflinger Unisex Wool Slipper comes with all the amazing and comfortable features you need in a slipper. They feature speckle wool, which provides them with nice detail, making them stand out in a non obnoxious way. Once you slip on the Haflinger Unisex Wool Slipper, you won’t want to take it off ever again. The slipper is built for versatility and comfort. It has been crafted using natural wool, maintaining your feet at the optimum temperature in both warm and cold environments. The slipper also comes with an internal lining material, which absorbs moisture, ensuring your feet will always remain dry. The molded arch support provides better alignment and an appropriate fit, while a waterproof rubber outsole provides traction and grip on various floor surfaces. After wearing them for some time, the slippers will mold to your feet, and are very comfortable to walk in. The boiled wool on the upper fits like a glove around the foot and the slipper is not itchy. It is machine washable and it dries overnight. It is available in different colors. On top of that, the colors do not fade, even after prolonged use. The slipper also maintains its shape throughout its lifetime. They have been fitted with a hard outsole, making it easy to walk on different surfaces, while providing your ankle, arch, and foot with support. These Haflinger slippers for plantar fasciitis will relieve all your foot pain. If you have been having problems with your feet, such as painful ankles, plantar fasciitis or painful arches, then your problems are no more, thanks to the ACORN Spa Wrap Slipper. Whether you are just relaxing at home, or pampering yourself at the spa, you can stay warm with this comfortable slipper from Acorn. They provide great padding, especially in areas that have a lot of moisture. These slippers, which are fully enclosed, come with an adjustable strap to provide a better fit. They are crafted using quilted black terry cloth, which is suitable for machine wash and dry. The weatherproof outsole is non-slip, keeping your feet secure, whether you are in the tub or the locker room. Molded polyurethane foam has been used to produce the contoured footbed. This goes a long way in enhancing your arch and heel support, which provides a massaging feeling to your feet. These slippers are made of non-animal products, and are duly registered with the IVS or the International Vegan Society. The company is renowned for producing indoor and outdoor footwear, which is soothing, cozy, and technologically advanced. The slipper is available in different sizes, from large to small. It is perfect for relaxation and pedicures. If you have been looking for slippers with arch support without much success, then you should check out the Vionic Indulge Sadie Mule. These lightweight slippers will keep your feet warm, cozy and comfortable whenever you are wearing them. The upper is made of textile, and you can adjust the size and fit, using the Velcro strap. Made using high-quality materials, these slippers will last a long time before they require a replacement. One great feature of these slippers is the seal of acceptance from the APMA, which means that they have met all the requirements and standards. Featuring a podiatrist-designed footbed, these slippers are designed to promote stability, thus alleviating pressure from your ankles and knees. And with their unique combination of style and biomechanics, you will enjoy great support to your feet, while making you look elegant. They come with a soft interior lining, which keeps your feet warm. Their outer sole is made of hardwearing rubber. Therefore, you can wear them outside to fetch mail or groceries, and you will not experience any slipping or sliding challenges. Cute, warm and comfortable, the Vionic Indulge is one of the best arch support slippers you can find on the market today. The DAWGS Microfiber Scuff are designed to provide long-lasting comfort and superior arch support, especially for people with back pain, knee pain, plantar fasciitis or arthritis. Their upper features a microfiber material, which is both durable and sturdy. Apart from durability, you will also love the comfort and warmth that these sandals offer, thanks to the thick, faux-shearling lining. This thick lining wraps your foot in comfort and warmth. Also, you will notice that this lining extends all the way to the cuff, thus making sure that your feet are cozy from the heel to the toe. If you have been experiencing pain whenever you wake up and step on cold, hard floors, then you finally have a solution to your problems. These arch support slippers are equipped with a memory foam insole, which provides underfoot cushioning, shock absorption as well as arch support. And with the slip-resistant rubber outsole, you can wear these sandals indoors and outdoors, without worrying about sliding or slipping hazards. These sandals are easy to pull on and off, their construction is of high quality, and they provide excellent arch support. Orthofeet Charlotte feature the same type of sole used on other Orthofeet footwear. For orthotic support, the Charlottes have been fitted with multi-layer orthotic insoles and a gel-padded heel seat and anatomical arch support, for alleviating heel and foot pain. This pain is normally associated with plantar fasciitis and heel spurs. The orthotic inserts are removable. If you are looking for a slipper that will give you a natural gait, then the Orthofeet Charlotte Slippers is perfect for you. The cushioning sole that is lightweight, together with the ergonomic stride design, helps to soften your step by facilitating a natural foot motion. This also helps to alleviate stress that tends to build up in the joints. The smooth, soft fabric lining, which is padded with foam, helps in eliminating pressure points while enhancing protection and comfort. They are especially suitable for sensitive feet. This also applies to people with rheumatoid arthritis and diabetes. An extra depth design, together with a non-binding upper, eliminates pressure on any hammertoes and/or bunions you might have. It is biomechanically designed, featuring a unique sense of comfort, making one of the best therapeutic slippers money can currently buy. When you are relaxing inside, you need to keep your feet warm. That is why you need a pair of comfortable slippers like the Sorel Falcon Ridge Slipper. The removable EVA footbed and the suede upper ensure your feet remain comfortable. The natural rubber outsole offers great traction, when you are indoors. This is a superior slipper, designed using advanced technologies. It has bound seams, which help in shaping the comfortable leather, used to make these slip-ons. The interior features wool blend linings, that will give your hardworking feet a warm welcome. It does not matter whether you are inside sipping your favorite beverage, or out fetching the mail… the natural rubber fitted on the Sorel Flacons will keep your feet steady all day long. It is available in different shades such as marsh, shale, bark and brown. Just choose the one you like the most, so you can be on your way to unsurpassed comfort in the most stylish manner. Straight from the box and onto your feet, you can easily tell that they are constructed properly. The multi-strand, heavy thread stitching and the thick sole, are working in tandem to make sure the Falcons will last you a long time. Although the soles are thick, they are still very flexible. They will allow natural movement of the feet and they run true to size. Moreover, the slippers are great. You’ll probably want to replace them with a second pair a few years from now. This slipper was designed with usability and comfort in mind. It is is super adjustable, featuring a removable anatomical insole and a wide opening. The removable insole can be replaced by gel shoe inserts of your own choosing. This can come in handy if you just so happen to have arthritic or diabetic feet and you require the ultimate in support and comfortability. The wide opening makes slipping these on and off very quick and easy. The slipper also features a leather upper, together with stylish stitch detailing. The interior has been lined with synthetic wool for extra comfort, cushioning, and support. The slipper also comes with an adjustable strap fitted at the instep. The main work of this strap is to open up the top and side of this slipper, to increase its adjustability. The slipper is available in both wide and medium widths. Therefore, you just need to select the size that fits you. The outsole is made of rubber. This allows this slipper to be worn as you perform various chores around the house, such as a quick dash out the front door to fetch your paper from the mail. The ergonomic stride sole and the wool interior, makes this the preferred choice, when it comes to combating heel pain. The main advantages offered by this slipper are a supportive arch, a replaceable insert, a rubber sole, extreme comfort and supportive straps. With the cushy lining inside these slippers, you can say goodbye to cold toes from now on. These slippers come with a durable rubber outsole, together with elastic flex strips, which adjust to your feet when moving around. There is a pull tab on the heel that makes it easy to it on. You won’t have to suffer from cold feet for as much as a second. These slippers have been manufactured using durable leather suede, keeping your feet comfortable and warm the whole day. These line of slippers, are among the best in the market today. They have been made in such a way that it makes them feel as if your foot is wrapped in sheepskin. The insole used is 100% sheepskin, instead of the cheaper sole used by most other manufacturers. The slipper is easy to clean, using a dry cloth. For maintenance, apply suede on the upper from time to time. This way, you and your Old Friend Romeos are going to be best friends for a long time. They are comfortable to use and very warm, thanks to the fleece lining on the inside. The workmanship and the quality of materials used, are better than some costlier slippers out there. Even when you are walking on wet surfaces, the sole will still provide you with reliable traction. Overall, they are just great a great pair of slippers to own. If you want something to put on your feet during the sunny summer days, then try out these leather sandals. Whether you are heading to the beach with your surfboard, or just going to the café for a cup of coffee. These sandals, that have been artistically crafted, will ensure that you arrive at your destination in class and comfort. Created using full-grain leather, the leather insole of these sandals feature original artwork. A canoe-lash stitching has been included on the leather outboard strap, to give the sandals a fine island finish. A larger toe area and arch are sufficiently supported by the wider design, to give you a stable step. In addition, a rubber outsole makes it easy for you to walk on sand and wet surfaces, without slipping, sliding, or any difficulties in walking whatsoever. A microfiber lining has been included to give these sandals a longer lifetime. They look totally awesome and they are very comfortable. You can combine them with nice linen pants or even a pair of shorts, to produce that summer time feel. The leather used on the upper will require some days to break in. After that, you can walk around in comfort and style all day long. The Spenco Supreme Slipper for men provides supportive touring and total stability. Together with superior comfort and support, this slipper is sufficiently equipped to meet your needs. The slipper features a high back design, to ensure a snug fit, while the pull loop at the back of the slipper allows an easy slip on. The sole, featuring total support technology, ensures proper alignment of your feet at the optimum shape. This is very important in reducing the development of nasty foot conditions such as plantar fasciitis. A deep heel and arch support, provides you with the best support you can ask for. At the same time, it reduces the pain that you might experience in your feet. When you are relaxing at home, especially during the cold winter months, you need a slipper, which will keep you warm and comfortable. The Spenco Supreme Slipper comes with a fleecy lining, that will make sure you get that and even more. Additionally, the quilted nylon upper provides additional comfort. The unsurpassed level of support offered by these Spenco Supremes, is something that is rare to come by. The sole is durable and strong, ensuring that they will serve you for years on end. The Mokasso 202 features a leather upper and an insole made of cotton and partial leather. For people looking for men’s slippers with arch support, the Romika Mokasso 202 Black Leather Slipper is totally worth a look. If you have been unlucky enough to have owned too many uncomfortable slippers in the past, then you should try out these babies. Be prepared to step into a whole new world of comfort, should you find the courage to take the leap. It comes with a clog style design, which lets you easily slip in and out. The slipper is streamlined and lightweight enough to ensure that you remain on your feet for a long time, without any discomfort. The interior fabric lining ensures that your feet do not sweat. They can also help greatly in the reduction or the prevention of plantar fasciitis. Quality, longevity and comfort are what you get with the Romika Mokasso leather slippers. They are true to size. However, if you prefer wearing slippers with thick socks, then it is advisable to order a slightly larger size. These slippers have been designed to give you the manliest form of comfort the world has to offer. These slippers are ideal for indoor relaxation. However, they come with rubber outsoles that enable you to step outside briefly, to take in some fresh air or just get your paper. They are easy to put on and remove. They are suitable for keeping under your desk or bed. They remain one of the best slippers for relaxation and lounging. These slippers feature cowhide trim, rugged and leather binding all round the sole, to produce that masculine feel. There are no textile bindings to be found on these Sheepskin Scuffs. Instead, garment-grade cowhide leather has been used. They are available in extra large and wide sizes, so they are suitable for those with wide feet. They are easy to clean, and you can apply some suede to maintain a clean and stylish look. The midsole is extra cushioned. The sole is durable and thick, yet lightweight. A cozy sheepskin lining ensures that your feet remain comfortable and warm all day long. If you are looking for a means of keeping your feet cozy this winter, without abandoning your style, then the Vionic men’s slipper with arch support might be the solution you are looking for. They come with uppers made of rich, elegant suede, featuring a round toe and moc toe stitching. These sandals feature an easy, slip-on design, while the 360-degree leather lacing system gives you an option to adjust your fit. These shoes are designed to keep your feet warm, especially during cold weather. Their interior is lined with plush and soft faux-fur, which not only keeps your feet warm but also cozy. The fur linings extend all the way to the cuff. On the other hand, the contoured, wool-covered EVA footbeds provide additional warmth and comfort. And with the durable rubber outsole, you can use these shoes indoors or outdoors. If you have flat feet and you walk a lot inside the house, then the Vionic Orthaheel Adler will work nicely. After a long day at work, your feet deserve to be pampered in utmost warmth and comfort. And this is where the Acorn Fave Gore comes in. These stylish, arch support slippers for men are versatile, comfortable and warm. You can wear them indoors or outdoors, depending on your preferences. They are equipped with the exclusive Cloud Cushion memory footbeds, which will make you feel as if you are walking on pillows. These slippers feature suede uppers are elastic, making it a breeze to slip them on and off. Also, the elastic upper panels make it easy to obtain a custom fit. The upper fabric and the stitching are sturdy. Therefore, you will continue enjoying all the great features that these sandals offer for a long period. The entire interior is lined with soft microfleece fiber, which provides comfort and warmth. Also, this lining eliminates uncomfortable moisture and regulates temperatures to ensure your feet remain comfortable and fresh every time. And with the non-slip rubber outsole, you can dash outside to fetch mail or a newspaper, without damaging your slippers. There are hundreds of arch support slippers on the market. 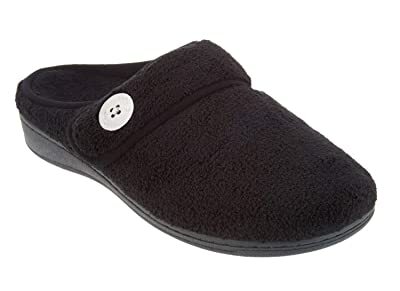 But if you are looking for a pair that will keep your feet warm and comfortable for a long period, then the Acorn Fave Gore Slipper will not let you down. This is a soft and warm slipper clog, which can be worn by both men and women. It comes with suede leather upper, and a cork latex footbed for arch support. The only problem with these slippers is that they are so comfortable that you probably won’t ever want to take them off. A shearling lining has been added to the upper, to make it even more comfortable. An instep lacing detail, together with a stand-up seam, gives this slipper clog its distinguished style. If you have high arches and insteps, then these Haflingers might very well save your day. Not only do they give you good arch support, they are made to last for a long time. There is no doubt that you are going to get lots of bang for your buck. Haflinger is a company which values craftsmanship above all else. The Saskatchewan Shearling is simply a really well made slipper, that you can’t afford to miss out on. It can be very beneficial to wear slippers with good orthotic inserts. It may be true that slippers lack complete ankle support, but you’ve got to at least shoot for arch support. The alternative is wearing nothing and therefore going barefoot, which I highly do not recommend at all. I know for a fact that there are people who have seen success in treating their plantar fasciitis, by simply adding slippers to their footwear portfolio. Let’s have a look at some of the benefits you can get from good slippers. You continue supporting your arches when getting home from work People usually throw off their supportive shoes once they get home from work, thereby losing all arch support for the rest of the day. Then they go barefoot, which is actually really bad for your plantar fascia. You can wear slippers around your home, or even when you are running an errand. By switching from one footwear to the next, you have less wear and tear on your daily footwear and orthotics. They are easy to slip on and off, which encourages you to actually use them. They are very comfortable and warming. There are lots of people who suffer from plantar fasciitis. You can find them all over the Internet in forums and whatnot. You will also find plenty of testimonies to the fact that slippers with arch support can indeed help you out tremendously in increasing your foot comfort level. For example, take the Spenco Supreme Slide slipper, which I have placed an image of below. That’s just one example of how super comfortable you are going to be once you put those on. You will never want to take those off. Slippers, by nature, lack complete ankle support and full foot support. So it is hard to say what exactly the important features are of a good slipper. But we will simply have to look at the one thing that a slipper does have to offer. With regular shoes, you would go for a pair that has good arch support for your plantar fasciitis. You need to have good heel support with a good orthotic footbed. The midsole needs to be very shock absorbing, as to reduce stress to your foot. The slipper you are eyeing must have good reviews. What Are Frequent Complaints About Slippers Against Heel Pain? 1. When a slipper has soft material, it can often cause your foot to be unstable within the slipper. It is important that it stays fixed on the footbed. 2. They might be equipped with a decent orthotic footbed. But still, they do not have the kind of support that you get from a shoe. People are claiming that slippers with good arch support help a great deal in treating plantar fasciitis. However, there are no studies to back this up. However, there is plenty of anecdotal evidence to suggest that slippers can indeed help you combat heel pain. Plenty of reviewers on Amazon have commented on their supportive slippers. Now I know that this does not count as a scientific study, but at least it’s something, rathen than nothing. Whether you are looking for shoes or for slippers… in the end, they all use the same technology for creating arch support and heel stability. You may safely assume that their footbed builds are going to be pretty identical and therefore identically beneficial to your plantar fasciitis. It is well known in the scientific community, that walking barefoot is placing a big strain on your feet that can lead to severe foot pain in the long run. You will always want to make sure to get good support for your plantar fascia. You can prevent your foot ligament from becoming inflamed and aggrevated by wearing good slippers around the house. In 2005, there was an article published that talked about foot disorders, especially the most common one… plantar fasciitis. There are plenty of physicians who tell their patients to avoid walking barefoot at all costs. Flat shoes are almost as bad as barefoot, so those are a no no as well. It is important to wear footwear with a cushioned heel cup for your achilles tendon. You can also benefit from stretching exercises. These are pretty much your options. There are plenty of people like you, who also suffer from heel pain. And they have shared their reviews of which slippers have helped them cure their plantar fasciitis. Most people report at least a noticeable decrease in their heel pain, by simply wearing an around the house slipper that supports their arches. Also, most people notice relief instantly. Go to the walking shoes overview page by following the link. Looking for something comfortable for during the summer? Check out my flip flops reviews! While slippers do not give you full foot support, they are certainly better than wearing nothing at all. All in all, they are a great addition to your everyday footwear, if you want to take it easy on your platar fascia ligament. Some people don’t like wearing slippers, and would rather go with a flip flop. There are flip flops out there that are foot contouring and can also provide support. Whichever choice you end up going for… realize that there are people just like you out there, who have tried out many options already. I myself have gone from one product to another, until I found the one that was just right for me. There is a supportive slipper out there for everybody, that will make them feel comfortable. 4 What Makes For A Good Slipper? 5 What Are Frequent Complaints About Slippers Against Heel Pain? I need a wrm slipper with at least a 1 1/2 inch heel for my bad achilles tendon injury. Can you help? I’ve never really come across slippers with such high heels. In your case, you might want to create your own solution by going for a slipper that has removable insoles. And then go for insoles that give you the high heel you want. Check out these Pixnor height increasing insoles. You can give yourself a really big heel-to-toe drop with those in order to alleviate the strain on your achilles. I use skechers d lites clogs. I remove the footbed and put in my soft orthotics with a lift. I have foot drop and a short leg. Thick rubber sole is cushioning. Wear socks for warmth. It’s too bad that the entire video is only so.id black! The video on this page works fine for me. What problem did you run into? I have (and love) the Women’s Acorn Chinchilla boot slippers, grey/black XL, but they are too small for me and they hurt my toes. Their XL is 9 1/2 -10 1/2 but they seem small. (They fit my mom’s 8 1/2 -9 perfectly). I am looking for a nice boot style that is just like my chinchilla pair. If Acorn made a Men’s version that looked almost identical to the women’s Chinchilla boot, I would be in comfy feet heaven. I have problem feet and have had 3 surgeries on them, so comfort is a must. Must be thick soled, (same outside sole would be nice), and have arch support as well. Is there anything out there that will make my feet happy? I’d try out the Orthaheel Gemmas, if I were you. If you check the ‘fit’ statistics on Amazon, you’ll see it runs a tad bit large for some people. So small chance of these hurting your toes. They get rave reviews. It’s hard to go wrong with quality footwear like that! Are there any slippers good for PF that are not “clog” style? My ankles get cold! Sure, there are plenty of them! How about number 4, the ACORN Chinchilla Collars? They look pretty warm to me! Hi, I have been recommended to wear a gel in the shoes below the heel because of exotosis. Are there slippers with such a gel. What is the best option for slippers if there are non with gel below the hell. I think you’d be best off going with a slipper that has a removable insole, so that you can put your own in there. How about the Orthofeet Ashe Villes? ? And I’ve got some gel insoles for you too! You can simply click the links and they will take you to Amazon. I need a house slipper with a minimum 1 inch heel for my (Achilles) issue and that is suitable for flat feet which pronate moderately. Please help! I’d go with the Orthofeet Charlottes if I were you. Although it isn’t officially stated in the product description that the heels are 1 inch… they look about 1 inch to me. They’re also good for pronation. Let me know how you like’em! Hi Brian thanks so much for the recommendation but I can find them anywhere in my city…Ottawa Canada. IS there another type of slip on you can recommend. Have you heard any good reviews about the vionic relax slipper? Vionics is a reputable brand. Hard to go wrong with them. I have no idea which slippers the stores in Ottawa have in stock, so it’s going to be hard for me to make a recommendation. In my previous recommendation to you, I’ve linked to the slipper on my site. You can order it from Amazon if you like. I’m needing a house slipper that has no side seams as I have bunions on both feet on the inside of the foot. I need a sturdy sole, plus a soft lining that gives support to the bottom of the foot and doesn’t go flat… do you have such a house slipper? I need a wide width in a size 8. I’ve heard shoes made in China are smaller in size than American made. What is the return policy if the slippers do not fit? I’d probably go with one of the Orthaheels I have on this page, if I were you. Good soles and soft linings! Not sure of China made footwear is smaller in size. I never really paid any attention to that. Maybe one of my readers has a more useful answer to that one? Most of the links on this page will take you to Amazon. Amazon lets you return footwear if it doesn’t fit well. I am trying to find a slipper that has thick protection throughout the entire length of the sole. In addition to having plantar fasciitis, I had a surgery to remove a cyst on my right ankle in 2010 that got infected with a flesh-eating bacteria that destroyed the ankle cartilage and damaged the nerves and muscle throughout the right foot. The foot is sensitive because of the nerve damage, especially the toes. Four days before the initial surgery, my endocrinologist did the toe test with the microfilament, and all my toes were all fine. The nerve damage is not due to diabetic neuropathy. To this day my left toes are fine. After the multiple surgeries to drain out the infection, I lost feeling in my right toes. The surgeons said there could be nerve damage due to the surgeries, the infection, or both. Some of the feeling came back in the right toes a year after the surgeries, but there are shooting pains, and they are incredibly sensitive. I recently bought a pair of Isotoner slippers but the bottom at the toe end (my orthotics are not the long kind) is very thin and my right toes hurt on the bottom when I walk. My previous slippers, Dearfoams, had thicker soles and I did not have this problem with them. Unfortunately I cannot find that Dearfoams sells terry slippers anymore. My feet get hot easily, and my skin is sensitive to wool, so I do not want slippers with plush interiors. Also, I prefer slippers with backs on them, as with low/open back slippers I have to uncomfortably tense my feet to keep the slippers from sliding off. I like to switch to slippers halfway through my day as even the relatively soft Brooks Brothers tennis shoes (or sneakers, or whatever they’re called these days) begin to hurt my right foot on the top and sides of the arch (due to the nerve damage) about halfway through the day. I fear I’m going to get to the point that I can walk very little at all if I don’t find some good slippers. I realize this may be a difficult set of requirements to meet, but I thought I’d take a shot and ask. It sounds like if anyone can find slippers that would meet all these requirements, it would be you. I am very impressed with your thorough and detailed analysis in each review of the slippers in your lists. Sounds to me like you’d like the Spenco Supreme. A nice back. And no wool, by the looks of it. Despite the fact that your nerve damage is not due to diabetic neuropathy, diabetics & neuropathic patients suffer from nerve damage as well and they require special footwear for that. I have some comfortable slippers on my review pages for diabetic and neuroma patients. If the Spenco suggestion is not to your liking, then please check out those 2 pages. Let me know how it goes. Best of luck in finding the best slipper for your feet! The Orthofeet Charlotte should really help you out. It’s reviewed on this page. I also have a review page dedicated to footwear for neuroma. Click here to check it out. Any ideas on a women’s warm, slipper with good arch support? You can find them for men everywhere and you look for women’s and they are not winter/ cold friendly or focused more on fashion than comfort and feet happiness. My feet are always freezing and I have flat feet. I can’t walk around barefoot any time of the year. My Adidas sandals for summer have great arch support and have not worn anything else at home….but nothing to protect the feet from cold. I’d give the Orthofeet Charlottes a shot if I were you. Are there any supportive thong style slippers you can recommend? My feet swell & like to breathe! A thong style slipper is really just a flip flop. I wear the Hari Maris around the house, myself. They are so good, a friend of mine tried them out and bought them as well. Good footwear for hot summers. 1) really warm slippers – but what do I wear the other half of the year in the house, other than my outdoor shoes? Actually, this page has as many women’s slippers as it does men’s slippers: 10 for each. Just have a look at the table of contents at the bottom of the article. It’s indeed hard to find a slipper for all year around. But then again, why would you want to? I wear slippers when it’s cold and I wear my trusty Hari Mari flip flops when it’s warm. I think you’re trying to tell me you want to wear something comfortable that does not have a thong and you need to be able to wear it around the pool? You may want to check out my water shoes review page. If you want footwear with a thong, then either check out my flip flop page or my Hari Mari page. My arches have fallen and need a good slipper with arch support. Suggestions please and thank you. I’d go with the Orthaheel Relax if I were you.